Closeup of the motif on the $2 note, Science presents Steam and Electricity to Commerce and Manufacture. 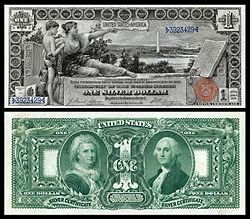 "Educational Series" is the informal name used by numismatists to refer to a series of United States silver certificates produced by the U.S. Treasury in 1896, after its Bureau of Engraving and Printing chief Claude M. Johnson ordered a new currency design. The notes depict various allegorical motifs and are considered by some numismatists to be the most beautiful monetary designs ever produced by the United States. The obverse of the notes depict a neoclassical allegorical motif, which dominates the front of the note. The motifs are meant as representations of the theme written on the note. The back contained the profiles of two American figures (usually famous Americans) set against an ornate background. Denominations of $1, $2, and $5 were produced. In addition to $1, $2 and $5 notes denominations of $10, $20, $50, $100, $500 and $1000 were also planned. Designs for a $10 and $50 denomination were being prepared but were never completed or produced before the series was abandoned and replaced by the series of 1899. Four artists were commissioned by the BEP to produce key artwork including E. H. Blashfield, Will H. Low, C. S. Reinhart, and Walter Shirlaw. Other design and engraving work is as follows. The naked breasts of the female figures on the $5 silver certificate reportedly caused some minor controversy when several Boston society ladies took offense to the design. Some bankers reportedly refused to accept the notes in transactions, and the term banned in Boston allegedly originates from the $5 silver certificate. In response the Bureau of Engraving and Printing prepared a "draped" bosom $5 vignette design for a proposed 1897 series. The redesign also included a highly modified front face but was never utilized. Also for the first time in 1893, Bureau authorities invited a small group of outside artists and engravers to submit design proposals for the new series of notes. The presence of the outside group caused tremendous creative problems within the BEP. Great personality conflicts and jealousy could be[clarification needed] one reason that although the $1 design was approved in July 1894 the remaining two notes were not accepted until late 1895. At one point during the process BEP designer Thomas Morris resigned. Coupled with being banned in Boston the notes were quickly replaced by the Series of 1899 notes. ^ A Guide Book Of United States Paper Money: Complete Source for History, Grading, and Prices pg. 27 "It is delightful to that the most beautiful designs, in the opinion of many, are those that were used on the smaller denominations..."
^ Tome Wilson. "Late Victorian-era money in America". (September 6, 2010). ^ A Guide Book Of United States Paper Money: Complete Source for History, Grading, and Prices pg. 106 "The uncovered bosoms of certain of the figures in the scene caused several Boston society ladies to rally against the design, and some banks to resist taking them - the origin of the term "banned in Boston." ^ Federal Reserve Bank of San Francisco (2006-04-05). "American Currency Exhibit: Metal Standards - Showcase of Bills". Retrieved 2006-10-31. Portions of this article used material from the Federal Reserve Bank of San Francisco website, which is in the public domain. This page was last edited on 18 September 2018, at 14:29 (UTC).